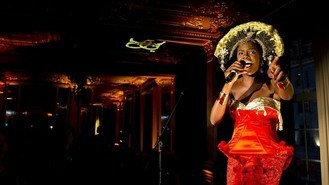 The London-born singer paid tribute to her Zimbabwean roots in a spectacular gold head-dress and elaborate red dress as she performed at London's Cafe Royal at a party thrown by Baileys, with a crowd including writers Grace Dent and Caitlin Moran and former The Only Way Is Essex star Lydia Bright. Shingai performed an acoustic version of brand new song On My Way, and then had everyone on their feet and dancing to hit Don't Upset The Rhythm. Grace and Caitlin both spoke about what they felt the spirit of woman meant to them, with restaurant critic Grace revealing her top beauty tip was not to go out with dried ketchup on your face, and Caitlin paying tribute to her best friend - the bra. TV presenter Jameela Jamil was also at the party, in a chicken suit, which she has agreed to wear for a month, raising over £16,000 for Comic Relief. She laughed: "I feel hot - and not in a good way." The event - hosted by Dawn Porter and including a DJ set from Jade Jagger - was held to launch Baileys' new bottle.